This is the first in a series of articles in which I would like to introduce new students to the club. Steve Lynch is 27 years old. He grew up in New Jersey and went to college in New Hampshire. From there he moved to Maine for three years, I guess to experience as cold a winter as possible. No wonder that when a bandmate called from Hawaii in December of 2012 looking for a roommate, he jumped at the opportunity to put winter behind him. One day after kayaking, he pulled his boat out of the water at Waiahole while Maui Doug was kiting. After watching for a while and asking questions, he decided he wanted to give it a try. From his first lessons I realized that Steve was going to be very good. He just had that special feel for it. Plus, he's been a joy to work with. One thing that impressed me was how he resolved a problem he had early on. Short on funds, he could not afford his equipment. All his attempts at procuring the money met with failure. Finally, to achieve some creative financing, he got a second job. He was completely up front with his new boss, telling him that once he had the money he needed, he would not continue with the job. True to his word, once he had the money, he quit the second job. 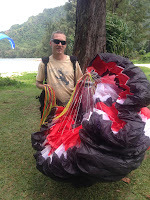 Steve has nearly completed his P2 training, and he has already made multiple flights on the Ozone Zero on windy days. We are lucky to count Steve among our numbers. I look forward to flying with him. Thanks for the intro, Woody. But you left out the most important part: what are we gonna call the poor guy to distinguish him from the other Steve? If he has a favorite nickname, now might be a good time to let us know, before he gets one assigned to him by this pack of monkeys! Welcome to the club and to your new lifelong addiction! It's great to see you progressing so fast! Just stretch your boundaries one flight at a time and fly as much as you can! It's also awesome to see all of Woody's students becoming such proficient kiters & flyers! I remember Woody's words when he was instructing me..."If you want to be a great pilot, you must first become a great kiter!" Thanks Woody for all of your great instruction, inspiration and dedication in sharing this awesome sport with me and everyone!!! Great to see so many people catching the Sky-alis addiction! You can always get a couple of extra pills from Woody, Thom or Alex!!! Keep up the good persistent practice and see you all in the air! Fly high and fly far!!! Best wishes with much Aloha! I guess like the Stars Wars Series Woody is starting in the middle and working his way forward? or back? Cause he has many intros to fill us in on. This is a great start, Steve, Alex is right get some kinda name you can live with. Mine I took when given to me from Reaper, only cause the way I was flying back then it could have been a worse name. Thanks to Woody and his God-like patience he's fixed a few of my problems, but I got more to tweak in future lessons, I just "he's ready". It's Time To Fly, Get Your Lessons Done and You'll Go Far!!!! !